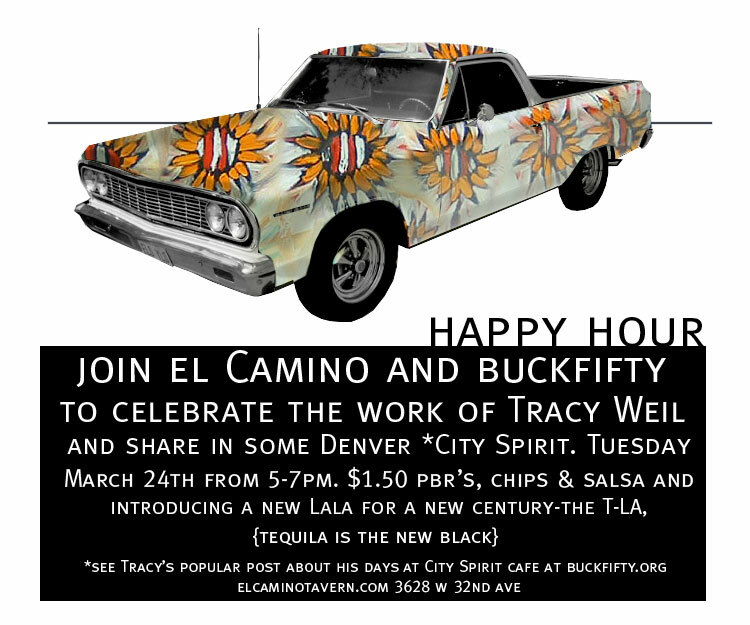 Join El Camino and Buckfifty to celebrate the work of Tracy Weil and share in some Denver “City Spirit”. Tuesday, March 24th, from 5 to 7pm. Buckfifty PBR’s, Chips & Salsa, and introducing a new Lala for a new century — the T-La. El Camino is located at 3628 W. 32nd Avenue in Highland. Visit elcaminotavern.com for more information. every summer, city spirit would host fashion shows from the years 1994 to 1996 (not sure what years they were exactly). denver fashion designers always looked forward to showing their designs. there were as an amazing variety of fashion being shown. the designers themselves and the models came from many different points of view and walks of life. in one show, you might see uzi designs (they sold their designs and other fetish-wear on colfax and pennsylvania, garden girl dresses (a retro-look if memory serves me right), ladybug clothing (fashion-forward), nur jewelry (the models would wear african-inspired headwraps), sugar twist kids (club kids who made everything they were wearing including their very high platform shoes which made them tower above everyone else in the show) and my own designs. at the time, i used the fashion shows to force me to come out with new lines on a regular basis as i was beginning my wholesale business. my big designs back then were candy-colored fake fur jackets, hats & bags and mini a-line skirts (some things never change!) and little mini-dresses with contrast vinyl banding at the empire waist. i’m sure all the participating designers were working really hard beforehand and when everyone arrived and dressed in the basement of city spirit, there was a lot of excitement in the air. each “posse” would check out what everyone else was wearing. you could always count on uzi to make a big scene even before the show. they would undress without modesty and make a lot of noise doing it. my models were pretty girly so they would scurry to dress behind the portable doctor’s screens that we used as dressing rooms. someone from the restaurant would come down, i think i remember the owner, susan wick coming down once, and try to get everyone’s attention and finally announce that the show was about to begin. before you knew it, the room had emptied and the show was on. while waiting to go on, the groups of fashion models would wait behind the restaurant. once my models told me they were ready to get into a scrap with the sugar twist kids in the alley because they were dissing my fake fur clothes. it was definitely a competitive atmosphere at times but i think everyone enjoyed the competition and vying for the audience’s attention. once you got through the restaurant, there was a runway on the sidewalk where people were sitting in chairs. a lot were fans of the designers, but there were a lot people walking through on their way to the bars in lodo and they were in a for a big surprise but they seemed to love it. there was a lot of hooting and hollering. in the second year, the show had gotten so much word of mouth, that it was necessary to open another space next to the restaurant. the music was eclectic and you never knew what was going to play next. most of the modeling was more like dancing. occasionally, a person from the audience would get up and groove on the runway. the craziest moments were always provided by uzi. they would feature models in diapers or with whips and i remember hearing from a few shocked but amused audience members that the uzi people were whipping onlookers. i learned a lot from doing those shows. i’ll never forget clio ortiz’s work. it was my second fashion show ever and she had about a dozen gorgeous black models, all in “body-conscious” red dresses with black hats. it was a lesson in branding for me and i knew i had a lot to learn and i did! thanks, city spirit, tracy weil and especially susan wick for so generously hosting such fun fashion extravaganzas!